Guess who’s in trouble with her husband? 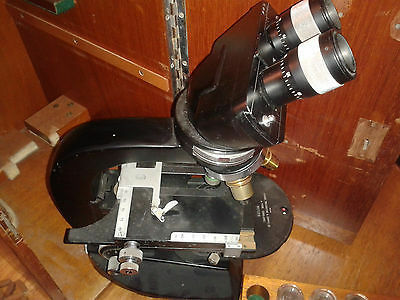 I was browsing on eBay and I saw a lovely Cooke Troughton and simms microscope. It appears to be a phase contrast microscope. I think it also has a magnification changer. Can’t be sure but I think so. £60, not a bad price methinks. I’ve seen magnification changers go for £90. I’ve only ever seen one CTS phase contrast unit for sale and that went for as much as this microscope costs. Even if the phase unit doesn’t work £60 is not extortionate. I have a bit of a thing for Cooke Troughton and Simms microscopes. They’re very pleasing to the eye but they’re also damn good microscopes. They are as good optically as many modern student microscopes but they have no plastic parts so they don’t break. Most important of all they are black with shiny bits. I love black and shiny things. This one looks rather grubby but I can fix that. It will be a nice project. I’m not sure if it has any phase objectives with it, but I have a vickers patholette and those objectives might just work. Vickers and Cooke microscopes have quite a lot of interchangeable parts. If the microscope can’t be made to work I shall break it up and use it for spares. I’m joking, I shan’t break it up for spares. I have tried to do that before. I once bought a microscope with the sole intention of cannibalising it. It had a rare objective with it that I needed. I didn’t need anything else off it so I intended to break it up and use the spare parts to give my other CTS microscopes a service. Needless to say the rare objective I desperately wanted was in an unusable state and the rest of it was in better condition than the microscope I was going to give its parts to. I now have two identical microscopes. One (the one I bought for cannibalising) is slightly better than the other but I eventually found suitable objectives and the two microscopes share them. They never complain. Microscopes are good like that. Also, I feel good today. I have decided to give up work and dedicate my life to microscopes and sewing. Work makes me depressed. I work as an in-class support worker. It’s not the staff – they’re good people. The students are okay too for the most part but I am completely disillusioned with the education system. I could write a long post on why but I doubt many people want to hear it. Let’s just say my heart is liberal but my head is a traditionalist. The race to the bottom is real and I can’t be a part of it any more. I think at least half the people of half the world would be happier and healthier in every way if we could give up our work places. I know mine is toxic beyond belief. I should wear a fancy patterned hazmat suit! Haha! I’m very fortunate that I can afford to give up work. It will put an end to my buying microscopes but that’s okay. If I keep on we’ll need a bigger house! I just have to decide when to give my notice in. I think I’ll do it so as to leave over the Christmas break. Sort of sneak out of the back door. I have just bought my second CTS M3000 in a week on Ebay.My better half and myself all ready owned two M1000 and one M3000 with a monocular head. All have issues, as I have a limit of £20 when bidding, but there are not a lot of real problems. I saw your posts on the yahoo site. We originall bought in microscopes for our Grandchildren, but when we used the CTS, we could not pass them on. I retired from teaching many years ago after forty years service. I am now 76 and old enough to know better. We also took up playing in a jazz band when I retired. How disreputable is that? CTS microscopes are wonderfully addictive microscopes aren’t they? I’m not sure what it is about them – maybe the fine focus mechanism, maybe that they’re black and silver, maybe that they have good and sturdy optics? Maybe they are coated with some kind of mind controlling chemical? They are certainly very reasonably priced compared to some although I have noticed a sudden price rise on eBay over the last few days..I’m hoping microscopes won’t become too trendy. It will ruin all my fun. Jazz isn’t so bad. When you get into gangster rap your family will have cause to worry! Thanks for the reply. We are doing up a room for microscopy and art. At our age it takes time. However it takes a lifetime to realise that you can have a go at anything you wish to do, with a little success., and sometimes better than that.